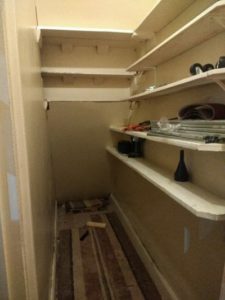 Under stairs storage cupboard project – Do your dream! Yep, another DIY project! 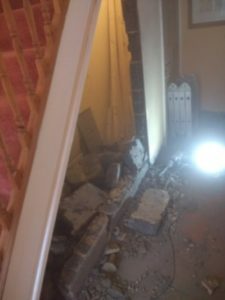 Our under stairs cupboard was large, but naff, and just unusable. I did make a storage cupboard inside, but that was pretty useless. 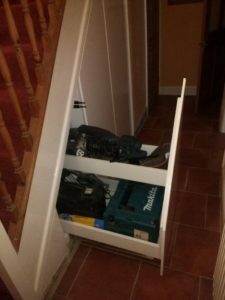 On visiting a friends, they had a pro installed under stairs cupboard with sliding pullouts which really made the most of the space. Our area was much bigger, but hey – how hard can it be….! The new framework was installed, probably over engineered 🙂 But with a couple of verticals, and solid batons level on the rear wall, it made the slider supports easily adjustable left/right and also up-down. So this removed any necessity to be overly accurate. 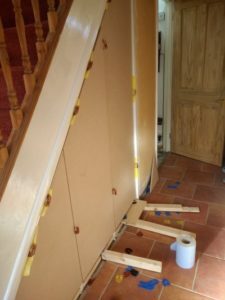 The upper horizontal baton on the wall is to “take the upward weight” when the units are out and the weight pivot on the front mounting and see-saw the rear upwards. 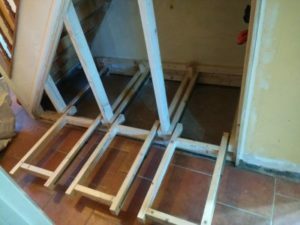 Once the platforms were made, the units themselves were made with screw n dowel using MFC board I ordered from DIY-Kitchens when we had the kitchen. This is solid 18mm MFC and again over engineered! The biggest unit must weight 45kg! With most of the MFC in pre-planned sizes, the units just needed tweaking to become a most solid unit. Again, designed so accuracy wasn’t that important, the units can fit on the base, swivel as necessary, and with spacers the angles can be tuned so its a perfect fit between the batons. This trick means everything can be off level but easily fixed. Finally, the front panels are 12mm MDF, cut with routed chamfer edge, and then with spaces put in the perfect place. Mounting from within the unit (awkward!) means the visible front door looks perfectly level. The fact it can be fixed to a wonky dogs dinner is the ideal trick 🙂 Have to say I’d not have attempted the build had I not worked out how to make it look neat! The units slide out on 60kg rated full extension runners, which are perfect for the smaller two units, but under-spec’d for the larger. Oh well. The project also included replacing the naff bannisters with some lovely oak and fitting the bannisters in a better way than a couple of nails of the last install! And finally, to fit engineered oak flooring.